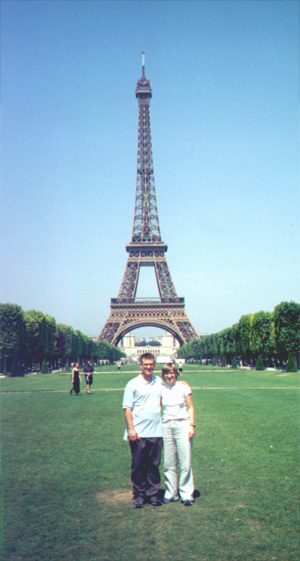 We flew into Paris on June 26, 2001, after an emotional good-bye, probably because everyone but me (Katie) knew that Brian was going to propose during the trip. Neither of us slept on the plane ride, so we were very tired when we arrived. Jay Sokol, Kathy Sokol, and Brian Kleinman at the Columbus airport before leaving. 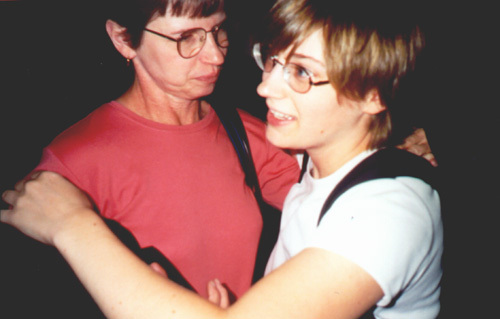 Donna and Katie Miller at the airport. 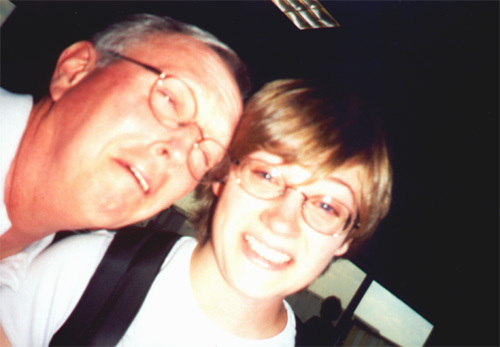 Dave and Katie Miller at the airport. 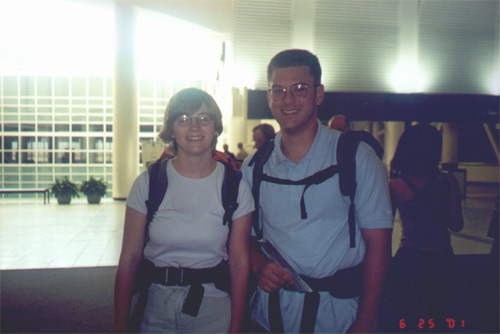 Katie and Brian at the airport. 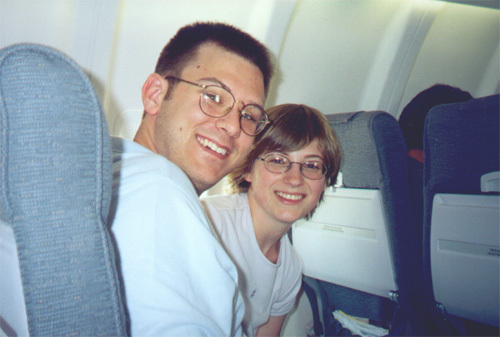 Brian and Katie on the airplane to Paris. After buying a couple of French phone cards, we finally figured out the phones and reserved a hotel room. 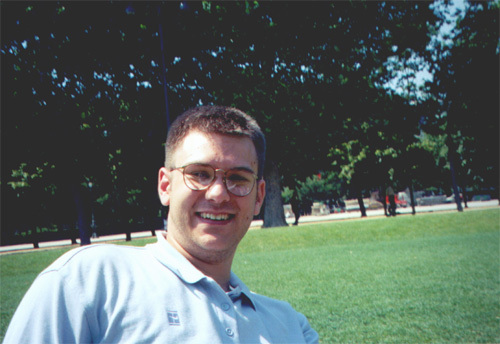 Then it took awhile to get out of the airport to the hotel, taking a shuttle to the metro and then taking the metro a fair way into the city. But after that we got some lunch food at a grocery store. 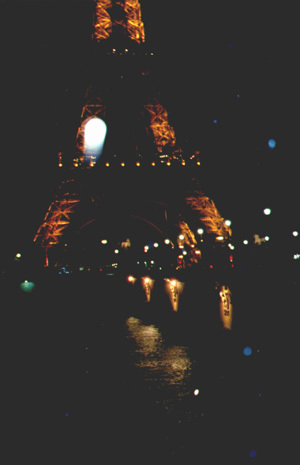 We were looking for a nearby park or somewhere to sit outside and eat and we luckily stumbled upon the Eiffel tower. Then Brian proposed and after telling him, “Shut up” several times, Katie accepted. 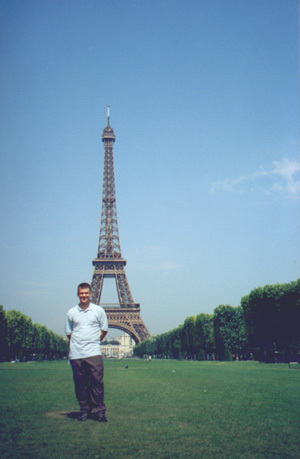 Brian at the Eiffel Tower. 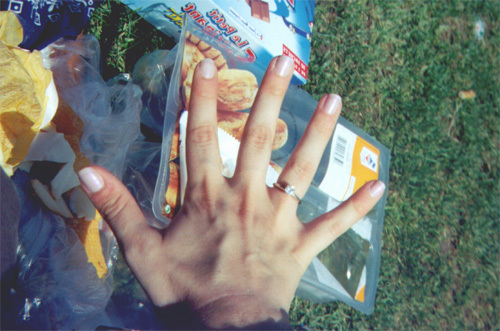 Katie’s ring, above the cheese and cracker lunch. Brian and Katie after the engagement. 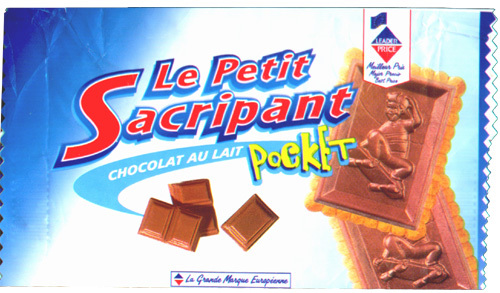 Our favorite snack: the petite skateboarder, very tasty. Our first European dinner, very creamy. On our way back to our hotel we got caught in a downpour. Still having all of our foreign currency on us for the whole trip, it got drenched. So our hotel room looked like some kind of spy operation as we tried to dry out our 5 different currencies. Of course they never fully dried and it smelled the rest of the trip. The Eiffel Tower at night and in a downpour of rain. 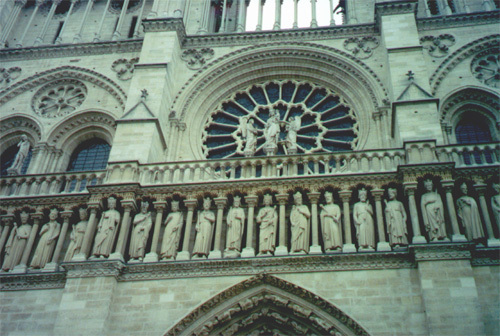 The next day we visited Notre Dame, the Memorial de la Deportation, and the Île Saint Louis. 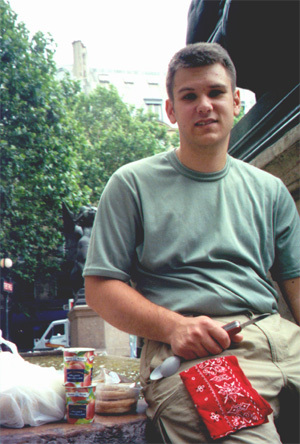 June 27, 2001: Lunch near the Hotel Deville. 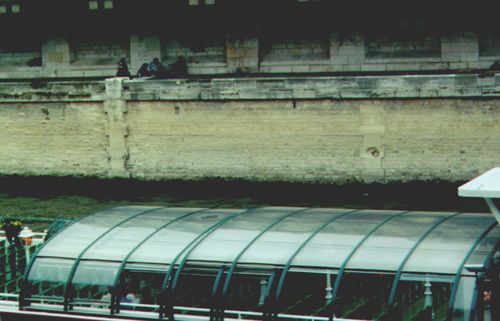 Homeless camped out along the Seine River, while one of the many tourist boats goes by. 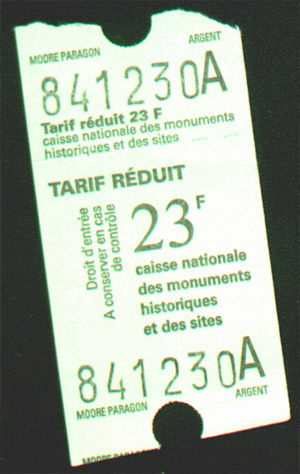 Our ticket stub for Notre Dame (23F is about $3). 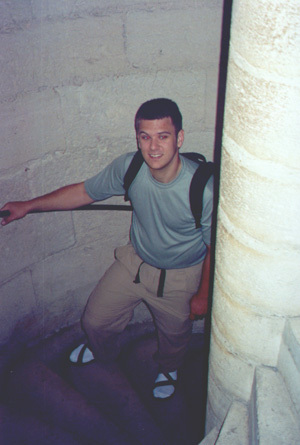 Brian climbing the stairs in Notre Dame. 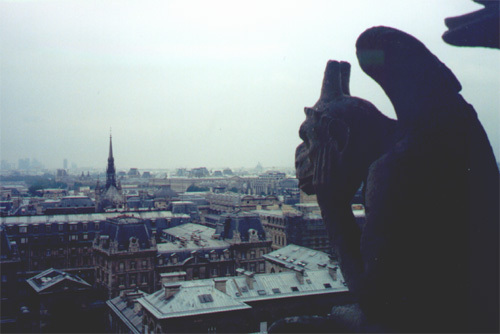 The view from the top of Notre Dame. Memorial de la Deportation, a memorial erected for the French victims of Nazi concentration camps. 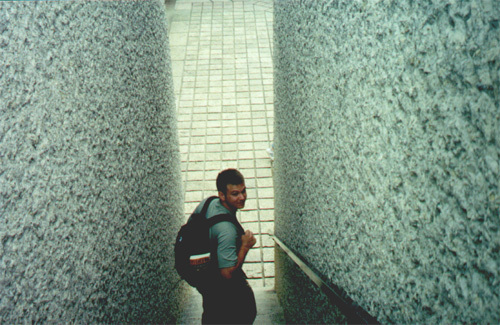 These stairs lead upward but there was no exit. 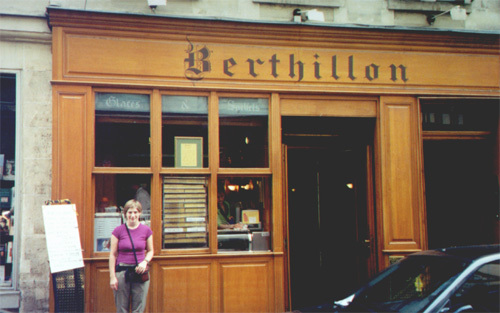 Berthillon ice cream on Ile St. louis. 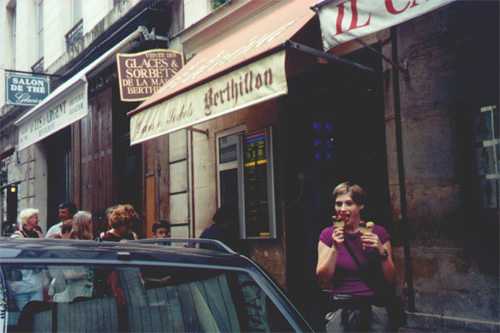 More Berthillon ice cream on Ile St. louis. 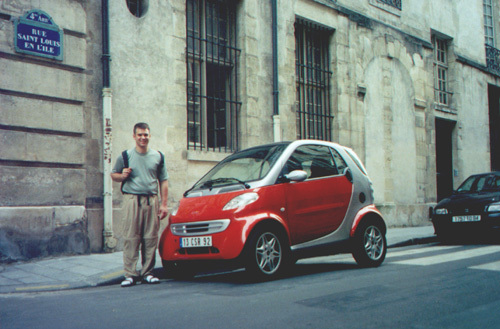 Brian with a Smart Car. We had a less creamy dinner and headed back to our hotel to prepare for our next destination: Heidelberg, Germany.